Ronald Powell is 36 years old and currently resides in Philadelphia, Pa. Upon graduating from high school, he earned his real estate sales person license after taking a course at Temple University. He aspires to open a Real Estate office soon as well as a few other business ventures. Ron is an Independent Agent/Recruiter for the National Motor Club www.nmcfs.com/41893. Ron is 6’2″ and enjoys reading Manga (Japanese Cartooons), playing sports and working out. We interviewed Ron for our “A Few Good Men” issue and here are his reponses on life and relationships. What is your greatest achievement? Making the decision to follow Christ, everything else is a result of that! How do you handle setbacks? I’m resilient, so keep on focusing on my goal(s) and use the setbacks as a way to learn what I can do better the next time. If there’s one quote you could live by, what would it be and why? “When you work for yourself you do not have the mindset of T.G.I.F. or the Hump Day attitude or the dreading Mondays, because you’re in control!” My why is this, I figured that I’d never gain financial freedom working for someone else! How have your life’s experiences shaped you into the man you are today? This is a continuous process, because growing up in North Philadelphia taught me that I did not want to become a product of that environment, so I now live accordingly. Are you currently on any social networking sites such as Facebook, Twitter, LinkedIn? If so, please list your handles if you’d like. 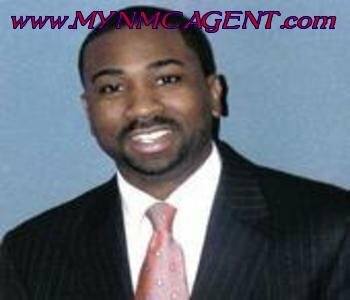 http://www.facebook.com/mynmcagent I’m only using Facebook for now. What is your relationship like with your mother? My mom and I are cool, I go down to see her as often as I can. Did you have a father figure or positive male role model growing up? Not really, but if I ever got out of hand my uncle(s) would step in when needed…lololol! Do you have any children? If so, what if your relationship like with them and their mother? My daughter is my “Sweetie Beetie” and we have the THE BEST relationship one could ask for! Her mom and I broke up several years ago, and we never messed around after we broke up, so we have respect for each other, even if we disagree on something we never let that get in the middle of raising our daughter. She’s my daughter’s mother NOT my baby’s momma, see the difference between the two? Why are you single or not in a committed relationship? I’m not focused on that right now, heck I’m not even considering courtship or female friends for now. I’m focused on my business, and my relationship with God, and my daughter. What is the longest relationship you’ve ever been in? Why did you break up? Did you learn anything from it? I think it was for about 2 years and we broke up because we both were immature. I learned to NEVER compromise on what I want, and when I see red flags DO NOT GO DOWN THAT PATH AT ALL! Do you want to get married? Maybe, if I find the right one, i’m sure she’s out there. What are you looking for in a relationship? The list is too long, but God definitely has to be IN CONTROL and the CENTER of it! What qualities do you find attractive in a woman? A God fearing woman, and i’m not talking about a religious woman either! How she carries herself, how she dresses (appropriately), who she hangs with, what she does in general, how she talks, the list can go on and on. What qualities don’t you find attractive in a woman? A non-godly woman, a ghetto woman, the list goes on and on. Do you believe a woman’s role is in the kitchen? Can you handle a successful woman? A woman’s role is whatever is going to make the house run as smoothly as possible, so if the husband is the better cook then so be it. I would prefer a successful woman because I would want to share what I’m building with someone who’s on the same level as me. When it comes to women, what is your definition of beauty? Of course physical beauty. But nothing beats the beauty of a God fearing/ & obedient woman towards God! Another best beauty to me is the TRUST/CONFIDENCE in her and hers in me and it’s evident when the two of us are not around each other. I want to say I really enjoyed your article it is so great to read about a man who is after God’s own heart. I will pray for your continued success. Be blessed and continue to keep God first.